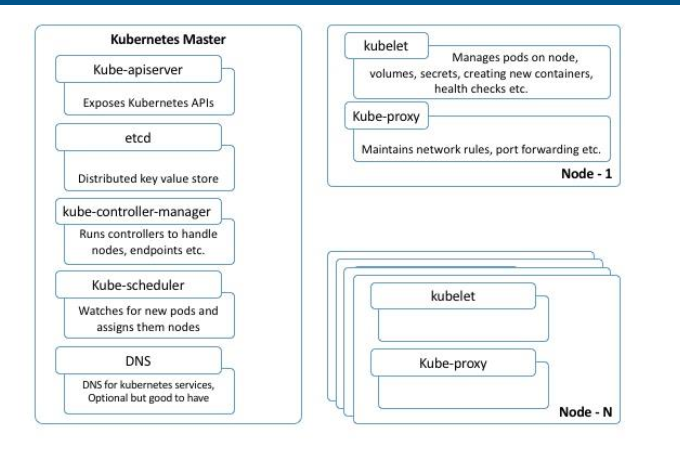 Kubernetes is a container orchestration tool that builds upon 15 years of experience of running production workloads at Google, combined with best-of-breed ideas and practices from the community. $ minikube start --docker-env HTTP_PROXY="http://127.0.0.1:7070"  --docker-env HTTPS_PROXY="http://127.0.0.1:7070"
To start with, we will only see one service, named kubernetes . This service is the core API server, monitoring and logging services for the pods and cluster. This container collects and sends the cluster logs file to the Google Cloud Logging service. This is the UI that we saw earlier. The controller manager controls a variety of cluster functions. Ensuring accurate and up-to-date replication is one of its vital roles. Additionally, it monitors, manages, and discovers new nodes. Finally, it manages and updates service endpoints. This container runs the API server. As we explored in the Swagger interface, this RESTful API allows us to create, query, update, and remove various components of our Kubernetes cluster. This runs the etcd software built by CoreOS. etcd is a distributed and consistent key-value store. This is where the Kubernetes cluster state is stored, updated, and retrieved by various components of K8s. The Pause container is often referred to as the pod infrastructure container and is used to set up and hold the networking namespace and resource limits for each pod. provides the DNS and service discovery plumbing. This is the system used to monitor resource usage across the cluster. provides the database and user interface we saw earlier for monitoring the infrastructure. This is the connector between skydns and kubernetes . Services in the API are monitored for changes and updated in skydns appropriately. This does resource usage and monitoring. This performs health checks on the pods. The pods include services for DNS, logging, and pod health checks. Pods essentially allow you to logically group containers and pieces of our application stacks together. 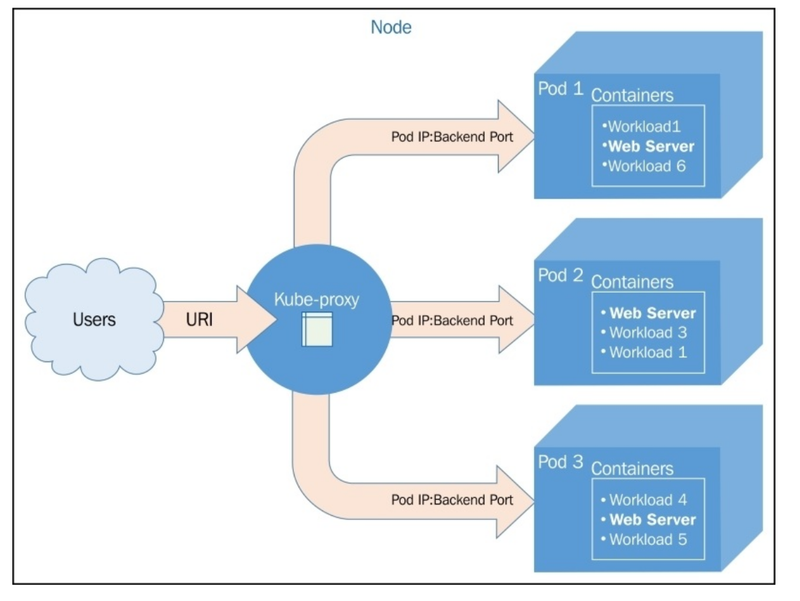 While pods may run one or more containers inside, the pod itself may be one of many that is running on a Kubernetes (minion) node. As we’ll see, pods give us a logical group of containers that we can then replicate, schedule, and balance service endpoints across. By default, this runs a command in the first container it finds, but you can select a specific one using the -c argument. Labels are just simple key-value pairs. You will see them on pods, replication controllers, services, and so on. The label acts as a selector and tells Kubernetes which resources to work with for a variety of operations. Think of it as a filtering option. Services and replication controllers give us the ability to keep our applications running with little interruption and graceful recovery. Services allow us to abstract access away from the consumers of our applications. Using a reliable endpoint, users and other programs can access pods running on your cluster seamlessly. 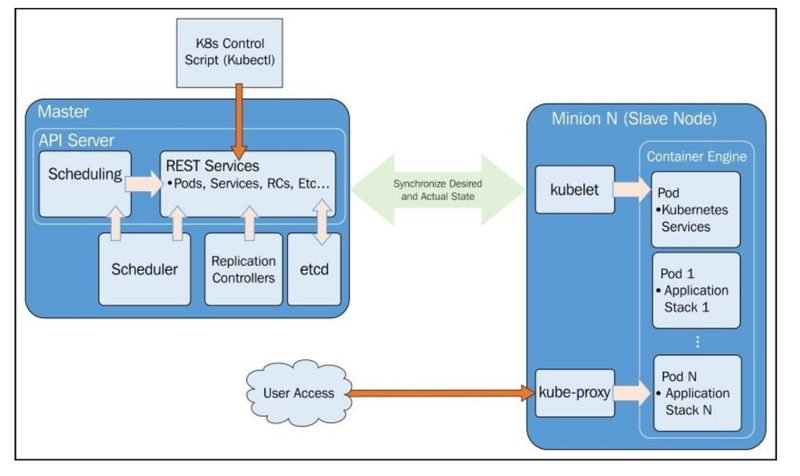 K8s achieves this by making sure that every node in the cluster runs a proxy named kube- proxy. As the name suggests, kube-proxy’s job is to proxy communication from a service endpoint back to the corresponding pod that is running the actual application. As the name suggests, manage the number of nodes that a pod and included container images run on. They ensure that an instance of an image is being run with the specific number of copies. RCs create a high-level mechanism to make sure that things are operating correctly across the entire application and cluster. RCs are simply charged with ensuring that you have the desired scale for your application. You define the number of pod replicas you want running and give it a template for how to create new pods. Just like services, we will use selectors and labels to define a pod’s membership in a replication controller. tells K8s what type of resource we are creating. In this case, the type is ReplicationController . The kubectl script uses a single create command for all types of resources. The benefit here is that you can easily create a number of resources of various types without needing to specify individual parameters for each type. However, it requires that the definition files can identify what it is they are specifying. simply tells Kubernetes which version of the schema we are using. All examples in this book will be on v1 . is where we will give the resource a name and also specify labels that willbe used to search and select resources for a given operation. The metadata element also allows you to create annotations, which are for nonidentifying information that might be useful for client tools and libraries. which will vary based on the kind or type of resource we are creating. In this case, it’s ReplicationController , which ensures the desired number of pods are running. The replicas element defines the desired number of pods, the selector tells the controller which pods to watch, and finally, the template element defines a template to launch a new pod. The template section contains the same pieces we saw in our pod definition earlier. An important thing to note is that the selector values need to match the labels values specified in the pod template. Remember that this matching is used to select the pods being managed. There are two ways Kubernetes can implement service discovery: through environment variables and through DNS. # Anything that the application would normally send to STDOUT becomes logs for the container within the Pod. # We can execute commands directly on the container once the Pod is up and running. Port: Port is the port number which makes a service visible to other services running within the same K8s cluster. In other words, in case a service wants to invoke another service running within the same Kubernetes cluster, it will be able to do so using port specified against “port” in the service spec file. port is the port your service listens on inside the cluster. Target Port: Target port is the port on the POD where the service is running. Taget Port is also by default the same value as port if not specified otherwise. Nodeport: Node port is the port on which the service can be accessed from external users using Kube-Proxy. nodePort is the port that a client outside of the cluster will “see”. nodePort is opened on every node in your cluster via kube-proxy. With iptables magic Kubernetes (k8s) then routes traffic from that port to a matching service pod (even if that pod is running on a completely different node). nodePort is unique, so two different services cannot have the same nodePort assigned. Once declared, the k8s master reserves that nodePort for that service. nodePort is then opened on EVERY node (master and worker), also the nodes that do not run a pod of that service k8s iptables magic takes care of the routing. That way you can make your service request from outside your k8s cluster to any node on nodePort without worrying whether a pod is scheduled there or not. The port is 8080 which represents that test-service can be accessed by other services in the cluster at port 8080. The nodePort is 33333 which represents that test-service can be accessed via kube-proxy on port 33333. You need to update DNS for registry.me on host and nodes. to enable it you need to set REGISTRY_STORAGE_DELETE_ENABLED=true env.